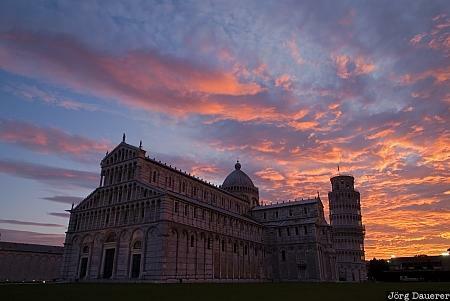 The Cathedral and the Leaning Tower at the Piazza del Duomo or Piazza dei Miracoli (Square of Miracles) in Pisa in front of a spectacular sunrise. Pisa is in northern Tuscany in the central part of Italy. This photo was taken in the morning of a sunny day in October of 2009. This photo is part of the exhibition Colorful Sunrise (October 2013). This photo was the image of the month in June of 2013. This photo was taken with a digital camera.